Italian version of a lovely dessert, great when you have company celebrating a special occasion. You can use any berry for the topping. 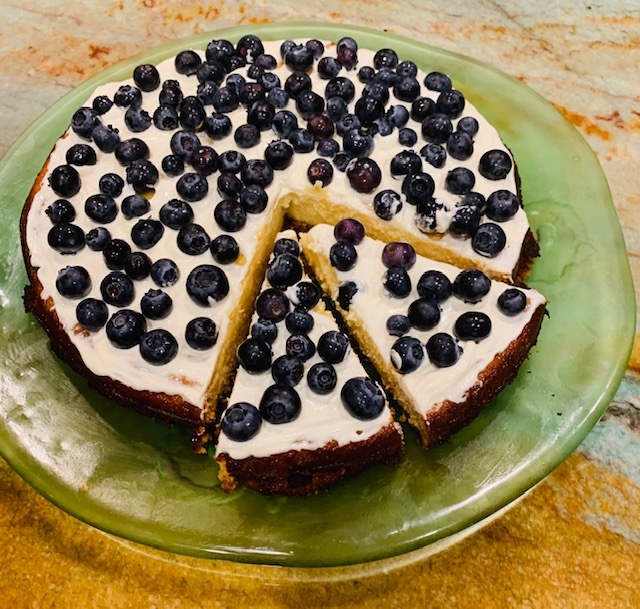 The blueberries and orange rind provide valuable nutrients and an awesome flavor, the almonds add healthy fats, and the sour cream gives a probiotic boost. In a bowl, combine almond flour, chopped almonds, and cinnamon. Mix in honey and ghee. Grease a 9-inch pie plate (or an 8- to 9-inch spring-form pan); press and spread crust into and up the sides. Beat all filling ingredients except eggs until smooth. Add eggs; beat on low until combined. Pour into crust. Place plate on a baking sheet. Bake until center is set, about 60 minutes. Remove from oven; let stand on a wire rack for 10 minutes. Spoon sour cream over the top of the filling. Sprinkle on blueberries over sour cream layer. Garnish with remaining 1 teaspoon of orange rind. Refrigerate at least 2 hours, or overnight.